Not long ago Qatar was known merely as a micro-state in the Middle East. Despite the Persian Gulf emirate’s carbon reserves, Qatar was largely under the shadow of its more powerful neighbors. Yet, in December 2010 Doha secured the bid to host the FIFA World Cup 2022, bringing the tiny Gulf Arab nation into the international spotlight and causing a surge in global media attention, particularly on social media. Qatar, with the world’s highest GDP per capita, has seen tremendous prosperity in recent years. Many have simply attributed the emirate’s remarkable economic growth rates to the World Cup, claiming that hosting the event is the principle factor driving Qatar’s boom. In light of the ongoing investigation into the World Cup 2018 and 2022 bids and the possibility of Doha being stripped of its right to host the event, Qatar’s future has been cast into doubt. However, this narrow view of Qatar’s prosperity overlooks Doha’s well-devised and multifaceted development strategy that Qatari officials created and began to implement years before the World Cup came into the picture. According to a report by Deloitte, Qatar is estimated to spend USD 200 billion on the World Cup, a tremendous investment compared to South Africa’s USD 4 billion in 2010 and Brazil’s USD 15 billion in 2014. A large proportion of this money is being spent on infrastructure development, which serves not only for the event but for the emirate’s development in general. Given that these projects are not only centered on the World Cup, there will not be a major setback in terms of spending if Qatar loses the hosting rights. According to a report by the Bank of America Merrill Lynch published in 2014, the estimated cost of losing the World Cup would be USD 16 billion, including lost revenue and cancellation of stadiums and other specific projects. This equates to a loss of 1-1.5 per capita GDP per annum each year until 2022, a figure that is not drastic given Qatar’s average GDP growth rate of 7 percent till 2015. Given the urgency with which Qatar is diversifying its economy—evidenced by recent growth in various sectors such as services, tourism, arts, and culture—these figures highlight how the current FIFA investigation does not pose a substantial threat to the emirate’s development. In 2014, Qatar boasted the highest growth rate in the services sector in the Middle East, with an expected growth rate of 7.8 percent in 2015. This is largely due to the underdeveloped financial sector that is rapidly expanding, given that Qatar is looking to invest its wealth to sustain economic growth while becoming less dependent on hydrocarbon revenues in the future. Also, as Doha challenges Dubai and Manama as a financial hub of the Middle East, a growing number of investment banks, consultancies, and sovereign wealth funds are opening offices in Qatar due to the large returns on offer. This trend is expected to continue as investors are increasingly drawn to Qatar and the emirate seeks to increase its investments abroad, as highlighted by Qatar’s acquirement of assets in important cities worldwide such as London and Washington D.C.
A major driving force behind the emirate’s development is Doha’s aim to establish itself as a popular tourist destination, which is related to Qatar’s developments in arts and culture, the hospitality sector, and transportation infrastructure. Exhibitions at the Museum of Islamic Arts (MIA) already draw a lot of international attention, and Qatar Museums (QM) plans to expand its range by opening numerous other museums such as the National Museum and Sports Museum. These initiatives will surely attract tourists to Qatar, particularly given the lack of such projects elsewhere in the region. Performances by world-renowned orchestras, promotion of foreign film, drama, and music are other major sources of attraction, both for tourists and for expats as job opportunities. Another side of the narrative, which often prevails in the Western media, is that taking away the World Cup will remove the only incentive Qatar has to curb human rights violations. This claim is based on the numerous reports published by various media outlets about the deaths of construction workers, their poor living conditions, and the lack of free media to address such issues. Qatari officials have released statements countering these accusations, questioning the validity of the statistics presented, and maintaining that the Gulf nation is pursuing meaningful efforts to improve the situation. Undoubtedly, drastic reform is necessary in terms of labor rights, the kafala (sponsorship) system, improving corporate accountability, and speeding up the judicial process. Although these reforms are being gradually implemented, the motive is not the 2022 World Cup, but rather Qatar’s image as a tourist, financial, and cultural hub. The World Cup has garnered Qatar much negative attention from human rights organizations like Amnesty International, and the emirate has taken the onus upon itself to improve, regardless of the mega event, due to the various other aspirations it has. If the FIFA investigation leads to Qatar being stripped of the World Cup, both the emirate and the Arab world will suffer a significant loss in the short-run, as will the sport itself. FIFA World Cup 2022 presents an ideal opportunity to truly globalize the sport, promote the game in the Persian Gulf, and create positive publicity for the region. However, the loss will barely go beyond a brief slump in popularity for Qatar, cancellation of a few projects and slowing down of some others. Some analysts even maintain that this would not necessarily constitute a negative development given the risks of the Qatari economy’s overexertion. 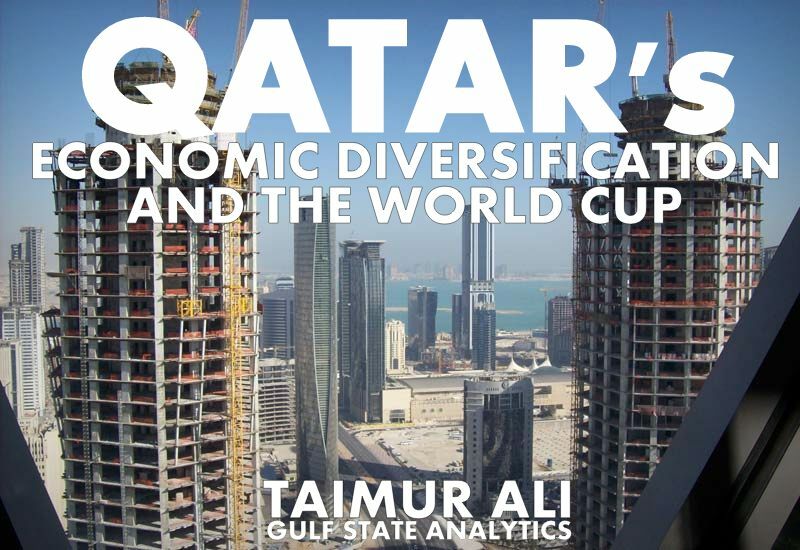 Regardless of how the FIFA scandal evolves, Qatar’s steps to achieve massive development are unlikely to be largely impacted given the emirate’s commitment to economic growth and diversification, of which the World Cup is only one tool out of many. Yet, such an outcome of the investigation remains less probable given that since December 2010 the Qataris have displayed their ability and enthusiasm to host the event while dismissing all accusations of corruption as mere fallacies on the part of the media. Taimur Ali is based at Georgetown Qatar. He has previously conducted research at the Research Society of International Law, Center for Policy and Governance, and the British Chamber of Commerce in Qatar.